The Metaltech ScaffoldBench is truly unique in the market. If you need a flexible rolling worksystem, you likely won't do better. Having worked with literally thousands of tools over the years, not a lot truly surprises me. When the Metaltech Scaffoldbench arrived at the shop, it looked like any other “flat-pack” metal shelving system…until I opened it up. This Scaffold Bench is actually four products in one. Whether you need scaffolding, a storage rack, utility cart, or a miter saw workbench on wheels, the Scaffoldbench does it. At just $325, Metaltech priced it just right, and you can pick it up at your local Home Depot. Everything comes in a box, safely packaged and ready for assembly in whatever configuration you want. Each box contains two upper and two lower ladders which stack, two side braces and two shelf braces, one platform (which doubles as a miter table), 11 wire grid shelf sections, four 5-inch casters, and 12 locking pins. The locking pins not only lock the casters to the ladders, but they also pin the braces in place as well. You also get four mounting brackets and multiple accessories to secure just about any miter saw to the table. If that’s not enough, the system has some interesting options to expand functionality. These include a top guardrail system ($128), basic 14″ outriggers ($109), 3-tier 46″ outriggers ($237), 6-foot Safeclimb Baker Style scaffold ($159), and material support rollers ($20 each). If you max out the system you can assemble an 18-ft tall Baker SafeClimb scaffold with top guardrail and outriggers for around $1,530. With that height, the maximum support weight drops to 735 lbs. When you have a system like this covering so many bases, whether it performs each task well becomes the primary concern. In the case of the Metaltech Scaffoldbench, we can run by each function individually to describe what you might expect. We brought two of these in-house and tested them in most configurations. With the Metaltech Scaffoldbench in scaffold mode, you get a system that can hold up to 1,100 pounds. It also stands 6 feet tall with all of the ladders installed. The integrity of the overall system impressed us. From the side braces with well-built interlocking pins to the sturdy platform, the system feels robust. In scaffold mode, you’re using both sets of side frames. You then mount the braces midway (or higher) up the frames to provide the proper reach. Then you drop in the steel-reinforced platform. Because the braces feature both locking stems and 45-degree braces, the platform stays very square regardless of your standing height. Storage is similar except that you may mount the braces lower or higher depending upon your needs. For our shop, we mounted them lower on the side frames and then placed the included wire shelf nearer to the top. Since we had two kits, we opted for a configuration that gave us two additional side frames and an additional set of wire grids and braces for a second shelf. The entire system stood around 9 feet tall. While we love all the flexibility, we’d prefer a singular wire grid in a future version of the Metaltech Scaffoldbench Miter Saw Workbench. As it stands now, you must assemble eleven small grids to make the wire shelf, and we found it easy for the individual sections to pop out of place. The advantage, of course, is that you can accommodate taller items by simply removing some of the wire sections. We particularly liked the Metaltech Scaffoldbench Miter Saw Workbench mode. This takes the platform and flips it upside down to expose the steel cross rails. Then, you simply place the four mounting brackets across the top and mount your saw and supports. We picked up a pair of the optional material support rollers. Those extend from the cross braces on the lower ladder section. They provide a total of about 9 feet of support. The rollers are basic, but they get the job done. To convert to a cart, you’d flip the table over and add the upper ladder to one side. With a single kit, however, we were able to get a tall rolling storage rack with three shelves and a rolling miter saw workstation. That’s not bad for $650. Incidentally, on the storage rack, we attached and kept the four miter saw mounting brackets. They simply exist upside down and out of the way—but present in the event we ever needed a second saw stand. Try to find another scaffold with as many features as the Metaltech Scaffoldbench. You likely won’t. 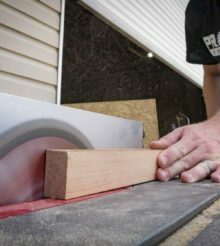 If you only need a miter saw stand, garage storage, or a solid rolling cart—this may not be for you. If, however, you can benefit from the flexibility of a 4-in-1 system like this, then the Scaffoldbench might be the ticket. It’s priced right at $325 and you can likely pick it up locally and save on shipping. This could be a new favorite for painters, warehouse workers, or anyone in need of portable storage and workbench solution.